Dining at 50 Local in Kennebunk offers a French bistro atmosphere with American flair, and really defines the farm-to-table movement through their commitment to local farms and fisheries. Located on Main Street in Kennebunk, 50 Local is a 10 minute drive from the 1802 House Bed and Breakfast. The restaurant is owned by local girl Merrilee Paul and her husband David Ross. This quaint bistro is small, intimate and casual with a bar on one end of the room and windows looking out on Main Street on the other side. They offer a full drinks menu and a good selection of wines. They make one of the best Cosmopolitans that Teri has ever had! Wines are largely from France with some other European wines on offer and a few American vintages from California and Washington state. There’s a selection of domestic and foreign beers in a bottle and one of Maine’s best craft beers, Funky Bow’s Red Ale and IPA are on tap (Roger likes the Red Ale!). Their menu changes daily with a few of their signature dishes being offered year around and they also have a good selection for vegetarians. Local Oysters from Western Bay and Ebenecook, Maine are presented on the half shell and salads are made from fresh produce purchased from local farms. We are particularly fond of the Crispy Farm Egg Salad which is served with Caesar Dressing, shaved Pecorino and a deep fried poached egg perched on top. Several of their entrée’s are firm favorites for us, if the daily special doesn’t entice us first. Their Fish and Chips are a lot like what you’d find in a good quality UK restaurant. 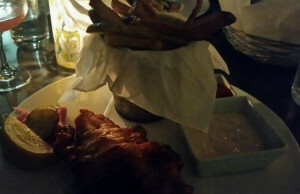 A nicely battered piece of Hake served with hand cut fries, tomato sauce (aka Ketchup) and a lemony tartar sauce. The Statler chicken is a periennal favorite, served with local vegetables, locally foraged mushrooms and crème fraiche potatoes. Roger had the special last night which was handmade pasta fettucine with butter poached Maine lobster. It was perfectly done. The Cassoulet is straight out of a fine French restaurant and the Fish Stew is a pleasantly spicy concoction of calamari, hake, local sausage and mussels in a tomato broth. The portions are good sized, but not so large that it’s hard to save room for dessert. Their Beignets are served with a Crème Anglaise sauce and are a perfect size for two people to share. They have some gorgeous gelato’s and if you want something light and refreshing, try the Raspberry Sorbet. Personally, we don’t think you can have a dessert menu without chocolate and 50 Local has their Chocolate Bundt Cake which will satisfy even the biggest chocaholic out there! 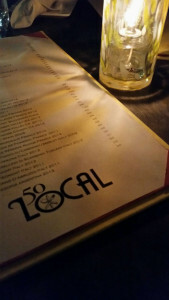 50 Local is open year around for dinner and we’d like to encourage you to make the trip away from Kennebunkport’s Dock Square to try this ‘locals favorite’ Kennebunk eatery when you next visit our area. Reservations are recommended, especially in the busy months. Please contact the Inn as we are more than happy to make reservations on behalf of our guests.